Zulu thistle. This is a formidable thistle clad in spiny foliage, but, much like seeing a Hell’s Angel biker reading Emily Dickinson, its flowers reveal a gentle and joyous heart. Soft white ray florets surround a darker center button, not unlike a prairie Echinacea. Easy yet rare perennial. Why would anyone drive to Port Townsend, on Washington’s Olympic Peninsula, just to buy plants, wondered my brother, who is definitely not a plant geek. The wild descriptions on the plant tags were what he fell in love with first at Far Reaches Farm. Then he met proprietors Kelly Dodson and Sue Milliken, who, together, are worth the driving time and price of a ferry ticket. Between the two of them, they tally seventy-five years of passionate plant addiction. Binomials seem tattooed into their brains; like the dirt under their nails, their attachment to the cultivation and breeding of plants will not wash out with a mere recession. The less obvious aspects of this nursery are the scholarship behind those plant tags, and the amount of time it takes to gather seeds in places like Nagaland (near the western border of Myanmar), sprout them, and grow the plants to a marketable size. Time and patience sometimes pay off for them: out of a batch of 1,000 seedlings of Meconopsis ‘Lingholm’, one appeared with amber to light lemon-colored leaves. 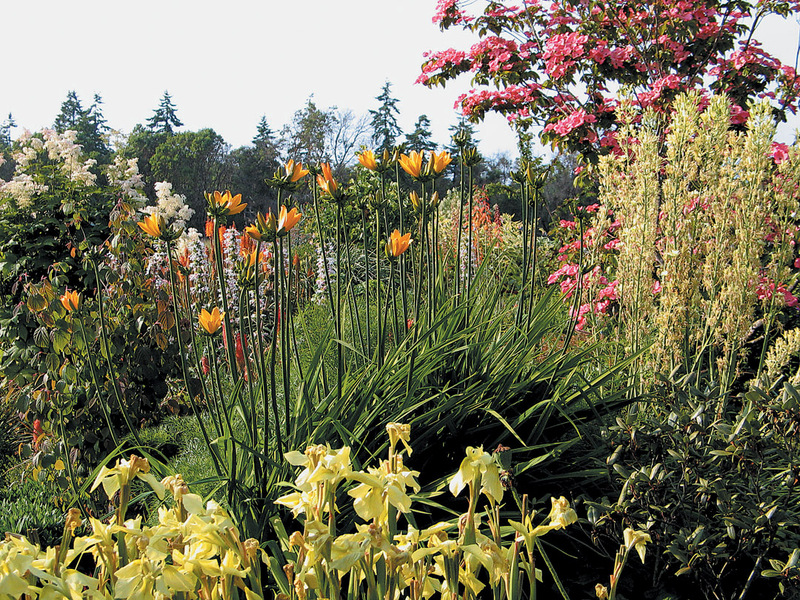 Fellow plant fanatics help out when they can; Jim Fox, for instance, has photographed the Crocosmia trials, and Dan Post has recorded their flowering times in an attempt to untangle the confusion of cultivars misnamed in the trade. When Kelly and Sue purchased the six-acre property in 2000, a substantial portion of the land was already preserved as wetland. This guided their early decision to avoid using non-organic pesticides. The green frogs and newts are an indication of how free their test plots and hoop houses are of pesticides and inorganic runoff. They depend on sound cultural practices, including soap sprays and a fairly windy site, to manage pests. They still use non-organic fertilizer in their containers but depend upon washed manure mulch to feed the in-ground beds. Today, many nurseries rely on plants available to them as tissue-cultured plugs, which come with built-in marketing programs and wide public recognition; it is far easier to calculate production costs and plot sales if your primary focus is the bottom line. Kelly and Sue take a different approach, growing their own plants from seed (often wild-collected), divisions, and cuttings. They engage in a healthy give and take with other nurseries and plants people, sharing both knowledge and plants freely. Peter Cox collected the rose purple Tibetan poppy (Meconopsis baileyi) in the wild, and shared seed with Kelly and Sue; the poppies are now a feature of their display garden. Their display gardens are carefully arranged according to the soil and exposure requirements of the plants to be grown in them. Over 5,000 taxa are represented in the collection; there are often many variations on a given species, but they are distributed throughout the display borders where their specific visual characters will serve best. 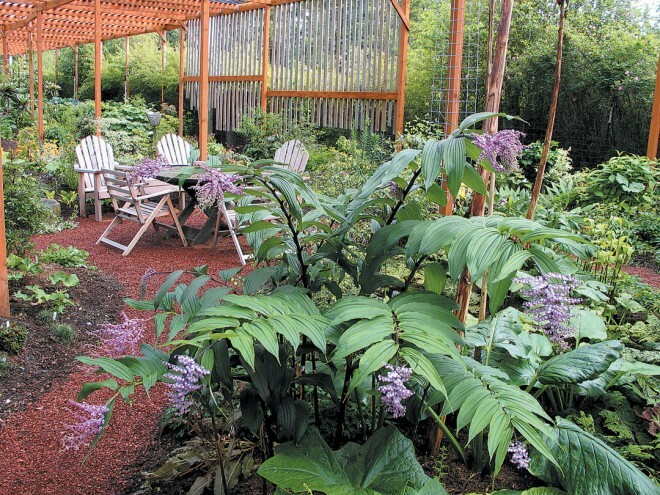 There are forty cultivars of Kniphofia, forty kinds of Solomon’s seal (Polygonatum), as well as drifts of the beautiful Chinese false Solomon’s seal (Maianthemum oleraceum) weaving through groups of unrelated plants that cohabit a given bed. Their memory of what occurs in the wild blends with their visual sensibility so that the scientific methodology serves the art of plant placement. If we mulch with dairy manure now, will there be nutrient runoff? In case there is, we’ll wait until the tadpoles have morphed into frogs. We let whole growing blocks go to weeds so as to not disturb our killdeer nest, just as we abandoned developing our bog garden during peak nesting time because the killdeer chicks hung out there. The killdeer parents have been back three years running and know us and our dogs. They expect us to toss them worms. Callie has learned how to respond to the bird’s alarm cry and bolts out of the house if she hears it, ready to drive away the crows. Kelly adds that, “The lowest branch on the Glyptostrobus in our small pond is a favorite of the goldfinches, who sit on to drink.” He mows the fields only every three years; this has helped attract more birds, including two species of rail, a Virginia rail and a sora rail, that nest in the wetland. In 2003, Kelly and Sue accompanied Steve Hootman from the Rhododendron Species Botanical Garden (RSBG) on a research expedition to Nagaland. A harrowing ascent of Mt Saramati yielded a single rhododendron, a natural hybrid resembling the elusive Rhododendron wattii of lore. Lilium mackliniae was one of their target species. 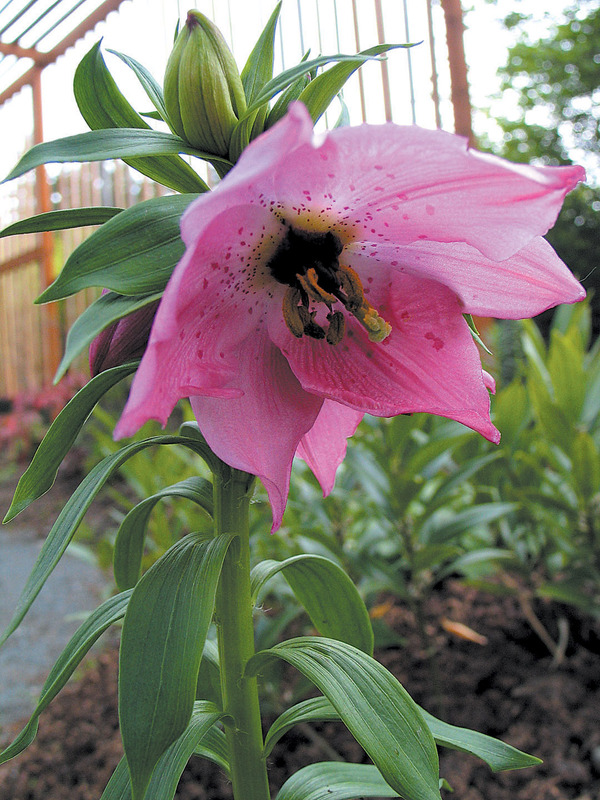 Four or five years later, the seedlings from a single capsule bloomed and proved that the capsule was from a distinctly different form of that lily. They have chosen not to accept seed-share subscriptions to support their travels, because of the pressure this exerts to over-collect sensitive species. A lot of the time I am cold and wet and hungry and uncomfortable and nervous about leeches and ticks and spiders and snakes and worrying about falling down a mountainside. Yet, I am awestruck traveling in the footsteps of some of the great plant hunters like Rock, Forrest, Wilson, and Kingdon Ward. Asia is home to countless new species and superior forms of familiar plants. I’m horrified by the ecocide happening in Asia, but collecting seed is good. We may be able to offer some of these species back someday. Their most recent expedition was to the southwestern part of China, on a trip organized by Steve Hootman, with Peter Cox of Glendoick, Scotland, and Keith White of Oregon joining. Kelly and Sue have an excellent staff as well as dedicated volunteers who keep their botanical Noah’s Ark in order while they are away. Their goals for the nursery and their collecting trips include providing unusual plants able to survive in a variety of West Coast gardens, including some where conditions may be less than ideal. Their reputation is built upon providing well-grown plants; the quality of their stock puts the lie to assumptions that exotics are difficult to grow. Producing those quality plants takes time: trilliums can take up to five years to bloom from seed, cardiocrinums seven. 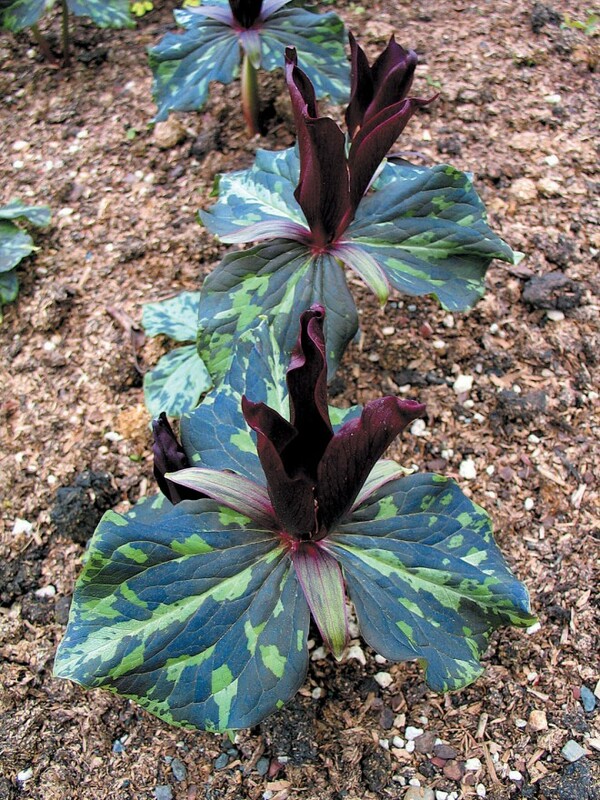 A hot new trillium, with mottled black leaves, is wait-listed to 2013. 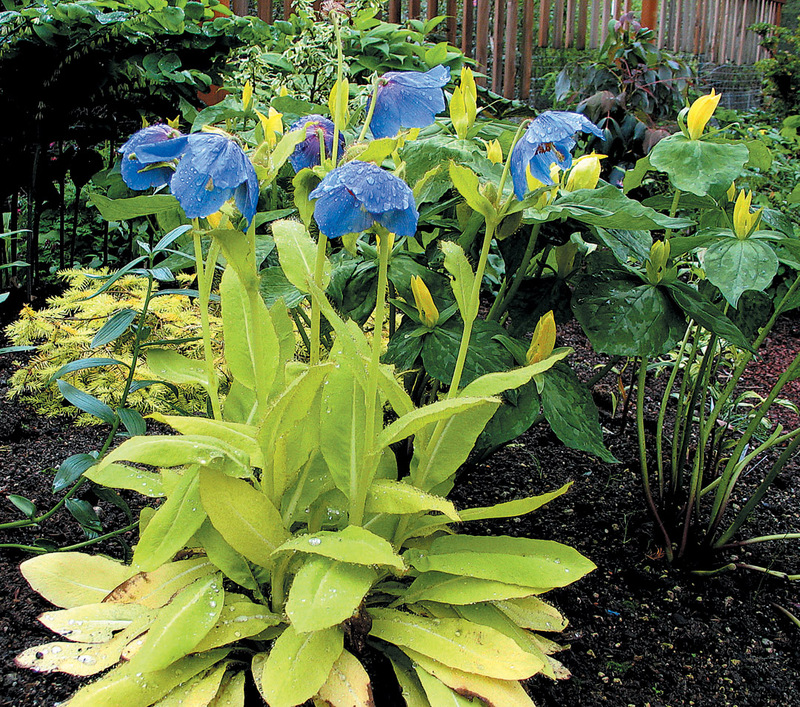 Far Reaches retails the state’s most varied selection of plants grown from their own stock. To display them, they designed and built a collector’s set of gardens. The bog, the 130-foot-long sunny border, the shade house, and the future scree have all been designed to present interesting groups of compatible plants. I loved the way color, texture, and form were manipulated by light coming through the shade house lattice; the structure is twelve feet tall, to allow room for the towering columns of Cardiocrinum to flourish. The pink-blossomed one represents a color break, a genetic mutation they grew from seed. They have just completed two new hoop-houses, bringing the total number to eight. The pergola and new pitcher-plant (Sarracenia) bog are close to the sales tables that form the heart of this retail nursery. Seating areas in the lath house and the pergola overlook a bronze devil’s claw seedpod, cast in patinated bronze by David Eisenhour. The sculpture and the Crocosmia test fields, set amidst the artisan-built architecture, combine to become a de facto performance piece. Everything changes with the weather and the hour. This matrix of art and science focuses our attention on the greater vision of the nursery: biodiversity, sustainability, and economic health in the out-back of the Olympic Peninsula. Far Reaches Farm is located at 1818 Hastings Avenue, Port Townsend, WA 98368. The nursery is open on select weekends from spring through early fall or by appointment (360/385-5114). Visit the nursery’s website (www.farreachesfarm.com) for dates, and for driving directions. Driving time from Seattle is about ninety minutes plus ferry crossing. 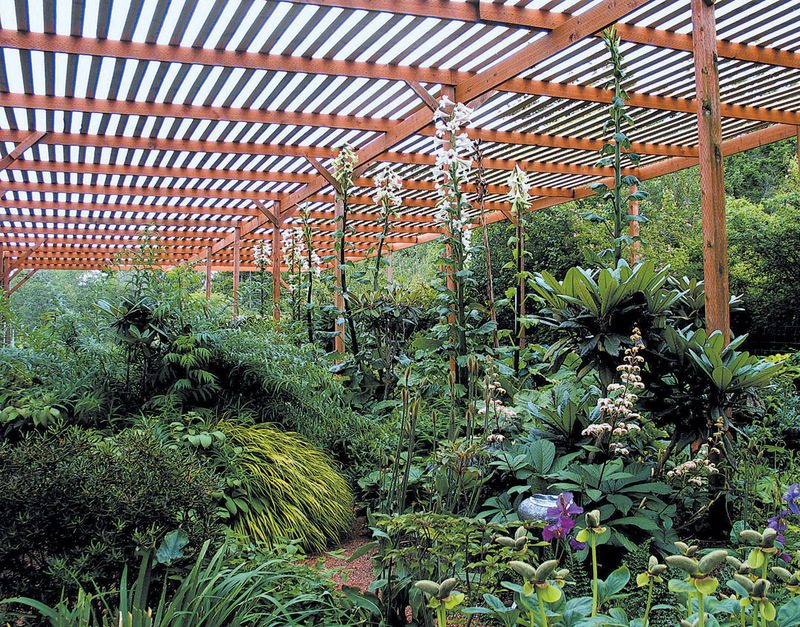 Far Reaches will also have a sales booth at garden shows and specialty plant sales throughout the Pacific Northwest. They have recently begun mail-order sales.